Roger Bisby tries out a new protection film. If my memory serves me correctly, Packexe was the original protection film, but, as with all good ideas, it has been copied by many others – some better than others. 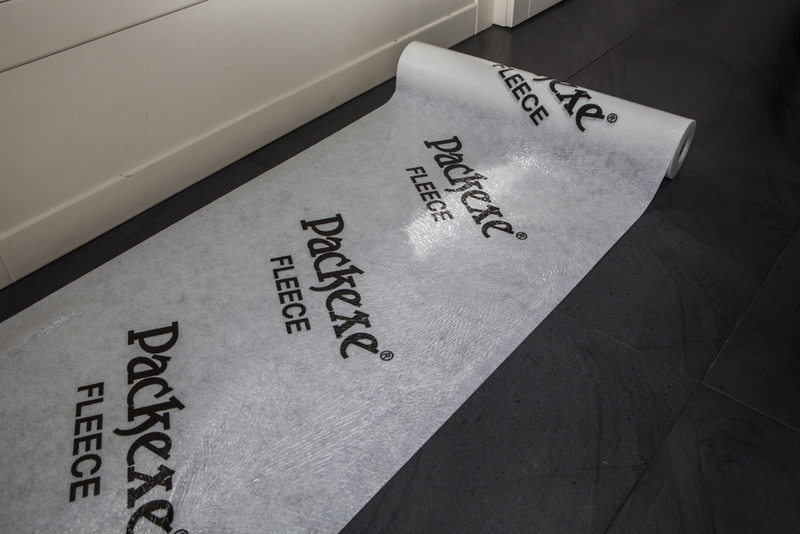 In order to stay ahead of the competition you have to innovate and Packexe has done just that by coming up with a new protection film that has the added benefit of cushioning and, joy of joys, is reusable up to 10 times. This does, of course, depend on how it is treated. I would suggest that the fleece is the first line of protection but, if you are doing heavy work, you would do well to lay down some hardboard sheets over the film. As good as this product is, dropping bricks and smashed tiles on top of it will drastically shorten its life. The film has been independently tested and is said to reduce the impact damage by up to 50 per cent. To be honest, I don’t know how anyone can measure such a thing, and I am not going to spend too much time dwelling on how I would measure it. The important thing is that you are laying down a waterproof layer and a cushion in one and, unlike dust sheets and polythene, this product will not slip and slide – so Torvill and Dean need to go elsewhere. The anti-slip is a double-sided thing. It has a low-tack adhesive on the back to keep it in place but the upper surface is also slip resistant. The obvious applications for this product are on wood and tile floors, but you can also use it on worktops, and even in baths if you are doing a bit of tiling above the bath and need to stand in it to tile. In the past I have used a dust sheet for this, but the bits of tile creep underneath it, but it is the impact resistance that helps most. I can’t be the only one who has had that nightmare where the sharp corner of a tile drops onto a bath – this product can help prevent that kind of damage, and the fact that you can bend it around the bath gives it some advantages over Correx sheet.